Hi everyone. It’s been three months. 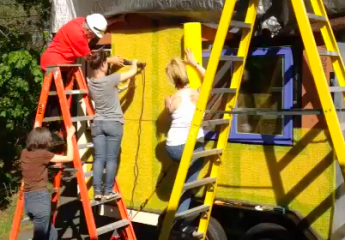 No mystery really, Tiny House sh* happens. Macy Miller broke her back building her tiny house. The misadventure began in November and December, I sustained three injuries; two fingers on my left hand have been in plastic casts and my right arm in a sling for months. And after nursing my daughter through two weeks of H1N1 in January, I decided to slow down and take a much needed vacation from “the build” to heal until Spring. Now that I can type again, I’ll be posting a bunch of blog entries I would have made in the next 24 hours so you can catch up. Okay, so I couldn’t hold a drill or a hammer without intense pain or further injury; but if you know me, I can’t sit creatively still for long. With my physician’s and physical therapists help though, you can see what mayhem I did get up to this winter! For those of you who want the details: While framing my walls and lofts, I smashed and shattered my left index finger distal phalange (tip) with a hammer. Then on a cold day while working on my roof with some volunteers, my drill got caught in some cut-off glove threads and drilled a hole through my left thumb nail to the bone. And, my right arm suffered severe tennis elbow due to overuse of my extensor tendons connected to my lateral epicondyle from too much impact drilling, lifting, sawing and hammering by myself. I hope the therapy works, because the operation required is no fun. Lesson learned: You cannot do a tiny house outside in nature all by yourself after work and on weekends in just 6 months on a limited budget. No matter how much you plan, expect delays due to weather, injury, construction material and building glitches. Sometimes you have to let go, roll with the punches, make lemonade out of lemons, and go with the flow. But here’s the thing, it’s all good. Taking risks, like this challenging dream, is what life’s all about!